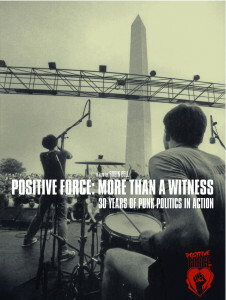 Punk activist collective Positive Force emerged in 1985, rising from the ashes of Revolution Summer. This feature-length film by Robin Bell skillfully mixes rare archival footage (including electrifying live performances from Fugazi, Bikini Kill, Nation of Ulysses, Anti-Flag, and more) with new interviews with key PF activists like co-founder Mark Andersen and supporters such as Ian MacKaye, Ted Leo, and Riot Grrrl co-founder Allison Wolfe. Covering a span of 25 years, More Than A Witness documents PF’s Reagan-era origins, the creation of its communal house, FBI harassment, and the rise of a vibrant underground that burst into the mainstream amidst controversy over both the means and the ends of the movement. In the best punk fashion, PF volunteers have applied creative DIY tactics and radical critiques to issues of homelessness, racism, corporate globalization, sexism, and war while struggling to constructively address conflicting dynamics and visions within the group itself. The film includes rare live footage of influential punk bands. Live Performances by: FUGAZI, SEVEN SECONDS, CHUMBAWAMBA, ANTI-FLAG, SOULSIDE, THE EVENS, AND BEEFEATER.